Mechanical gun safe will always be a big part of the world and with technology sometimes creating problems; many people decide to be kept in the past. The younger generation is now experimenting with the biometric gun safe and the older generation is slowly gravitating towards these safe as well. Many people do not trust the biometric gun safe for home use and thus decide to stick to the traditional and standard mechanical one. But these guidelines will definitely make it clear to you what are the top benefits of a biometric gun safe or a mechanical gun safe and what are the worst things of each type. And finally this will prevent you not to struggle to open your safe. Having a mechanical safe has always been the traditional way of keeping your valuables safe. But biometrics has now taken over and now we will explore the fundamental differences between the safes and help you make a better choice. Biometric locking features were designed for faster access than the electronic or keypad locking mechanism and to limit the need for remembering those complex coding systems. Aside from faster access, these safes also make it harder to pick the lock, but on the downside, they might be less effective as a childproof safe. Because they are more expensive than other safes and also require a lot more maintenance, they need to be kept down to a limit. The bigger the safe, the bigger the locking mechanism and the more power will be pulled from the batteries when you use the safe. Smaller compact safes have multiple features, but these features only use up a little of the overall battery and this is great for sustainability. Quick and Easy Access. While speed may mean the difference between becoming a victim and protecting yourself, it is definitely a great advantage to have. Biometric systems will open much faster and if you could add gas compressed technology, you will even have the ability to make your firearm ready while opening. Advanced Security. 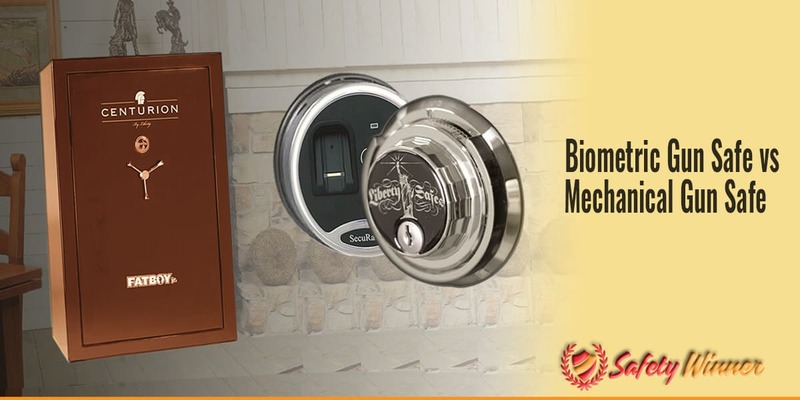 We cannot deny that criminals are getting smarter, but with biometric gun safes, you will be assured that the technology has evolved with them and you will have the newest methods of protection on the market. The Element of Surprise. Criminals may be able to prepare for mechanical safes, but with biometric gun safes, they will not know what to expect. Biometrics are continuously improving and unlike mechanical safes, each biometric gun safe has different added features to ensure that you can catch them off guard. Control of Access. Unlike with the mechanical lock, you will be the only one with access to the safe. Should someone try and force open the lock, it will shut down and you will have to wait a few minutes for the lock to cool down. Standard lock picking tools can not open the biometric lock and no one could possible steal or duplicate your key. Biometric gun safes are perfect for most situations, but their biggest advantage that they give the user is the ability to have fast and efficient access to their belongings. Aside from the faster access, they sometimes have lighting features and added USB ports for you to charge your items, but these will only be for limited use as it will speed up the depletion rate of the batteries and thus the safe will become even more expensive. Mechanical locking safes are also well-designed and strong, but they are a little cheaper and therefore some people think that the quality is lower, but for those that do know about pricing and how technology affects it, they will be able to make smarter choices between which gun safe goes where. Mechanical safes are the old style but still secured & lovable locking mechanism. They can be great for storing your larger rifles. They require much less maintenance and therefore they are also much cheaper gun safes in the long run. Another financial benefit is that they will be much cheaper when they are initially purchased and this could greatly benefit most people looking to gather and collect rifles. Durable. Mechanical gun safes cannot be tampered with by water or fire and this will force someone to use brute force to try and pry open the safe. The manufacturers will also have the added benefit of spending all their resources on strength and durability to ensure the safe withstand punishment. Reliable. With the mechanical gun safes, you will never need to fear the glitches and errors associated with technology. You will know that every time you need to open the safe, you will be able to open the safe with the key or turning knob. Fire and Water Resistant. Fires may not occur that often, but if they should happen, you will know that the mechanical safe should last significantly longer. While this is not the case anymore, in the past biometric safes were easily destroyed or rendered useless after being attacked by fire. Without technology, water cannot cause any errors or disrupt electrical currents. Cheaper. Technology is expensive and if you remove that element, you will save a lot of money on the safe. You will also be able to save some extra cash on things like batteries and technology upgrades that may come out from time to time. The biggest downside is the inability to added extras to the safe and you will not be able to use the built-in battery like the biometric gun safe has to power things like gun safe lighting features. You will need to use stick-on lights that have their very own batteries and this will once again cost you a few dollars in the longer term. Mechanical safes will not offer you much in terms of quick access, but you will not need quick access and the developers will be able to add much more security features at the same price. We believe that these safes will be stronger and better in water and fire hazard conditions and usually, you will still be able to open the safe with a key as the unlocking feature is sometimes made from metal and therefore, it will not melt or take electrical damage in the water.